World wide demonstrations were successfully organized on May 15 2009 by the committee of the International Network against Repression and Injustice in Ethiopia. 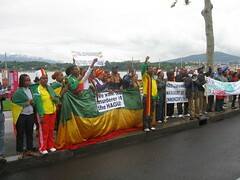 On this commemoration day of the 4th Year anniversary of the highly contested ethiopian election of 2005, Ethiopians in different parts of the world rallied at the United States Embassies in London, Berlin, Bern, Rome, at the White House in Washington DC, and at United Nation Office at Geneva. They appealed to the US administration for support in the struggle for freedom and justice in Ethiopia and the release of Birtukan Mideksa, Teddy Afro and all political prisoners. A five member delegation of the Swiss branch of the International Network was received by the United Nations High Commissioner for Human Rights, her Excellency Justice Navanethem Pillay.